DELZAO (AUS) (2000). 6 wins from 1000m to 1600m, MVRC John F Feehan S., Gr.2. Sire of 140 rnrs, 60 wnrs, inc. Round Mountain Gal, Stella Blonde, Boulevard Betty, Delegance, Delzina, Panarea, Banderilla, Miss Phromily, Dell, Fabulously Fake, Kapok, Lady Laetitia, Sirgasalot, Le Shaker, Sea Horse, Daryl, De Pony, Delrazzi, Delwonder, Terraplex, The Blue Angel, Invidia, Sombre, Sound of the Ocean, Cavallo Reigns, Etoile Rouge, etc. Sire of the dams of. Delegance (f. by Delzao). 4 wins. See below. Invidia (f. by Delzao). 3 wins from 1600m to 1800m in Aust. Dashing Diva (f. by Royal Academy). Winner at 1400m in Aust. ELEGANT LASS (Jugah). 5 wins. See above. Powlett Mews. 26 wins to 1400m, A$117,567 in Aust. Pine Jack. 4 wins from 1200m to 1600m in Aust. Demple Plains. 2 wins. See above. Simmo. Winner at 1600m in Aust. Adameus. 6 wins at 1300m, 1400m, WATC Artesian Graduation S., 6PR Swan Brewery Graduation S., John McGrath Graduation S., 2d WATC Symmons Graduation S., 3d WATC Fluent Graduation S.
Canona. 2 wins at 1000m, 1200m, WATC Footmark H., Not Amused Sprint H., 2d WATC Landcruiser Graduation S., 3d WATC Coette H., Smith H., Benbow Graduation S., Old Aquinians Association H., Pacific H. Producer. Anona (Ruantallan). Placed. See above. ASIAN BEAU (Beau Sovereign). 12 wins-2 at 2-to 1500m, A$192,150, WATC Railway S., Gr.1, Winterbottom S., Gr.2, Lee Steere S., Gr.2, Hyperion S., Gr.3, Prince of Wales S., Gr.3, Ascot S., L, Australia Day S., L, Parade Quality S., Easingwold H., Roy Paxton Welter H., Initial S., O'Grady Lefroy Sprint H., 2d VATC Futurity S., Gr.1, STC Canterbury S., Gr.2, WATC Quality P.H., L. Sire. TOP OPERATOR (Beau Sovereign). 6 wins-4 at 2-to 1400m, A$83,650, WATC Ngawyni S., L, Taurina Spa H., Langs Supreme H., Jovial Lad H., Aclis H., Telethon Welter H., 2d Western Australian Guineas, Gr.2, WATC Sheraton Perth S.H., L. Sire. SUPER PROFIT (Spinning World). 6 wins-1 at 2-at 1150m, 1200m, R483,510, Greyville Post Merchants H., Gr.2, Vaal Racing Express H., 2d Newmarket TC Senor Santa H., Gr.2, 3d Vaal Computaform Rating H., 4th Newmarket TC Tommy Hotspur H., Gr.3, Man o' War Sprint H., L, Turffontein Falcon Sprint H., L.
ASIAN ROYALE (Slant). 4 wins from 1200m to 2400m, WATC Belmont Oaks, L, Australia Day Cup, Eyre H., 2d WATC December H., L, Hyperical H., Black Jack Tournament H., Flightdeck H., 3d WATC Qantas Welter H. Producer. RED EYE SPECIAL (Marooned). 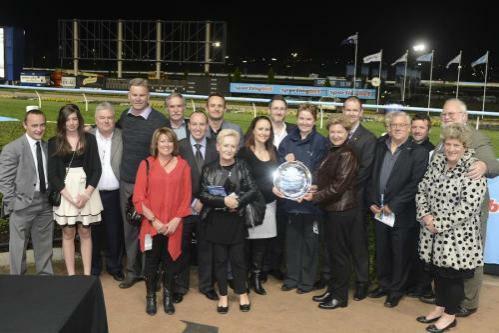 6 wins-3 at 2-to 1400m, A$126,850, WATC Roma Cup, Gr.3, Challenge S., L, Fairetha S., L, Little Sandown 2YO H., Lifesavers 2YO H., Healthy Choice 2YO H., 2d WATC Belgravia S., L, 4th Western Australian Guineas, Gr.2, WATC Strickland S., Gr.3, Grandstand Cup, L. Sire. 4 wins-1 at 2-at 1000m, 1200m, A$237,355, VRC Kane Constructions H., MRC Oasis H., MVRC Mayoral Charity Community H., 2d VRC Eugene Gorman 2YO H., 3d VRC Mark Taylor H., MRC Le Pine Funerals H., MVRC Late Starter Membership $99 H.
Served by Reward for Effort. Date of last service, 19.10.2014.